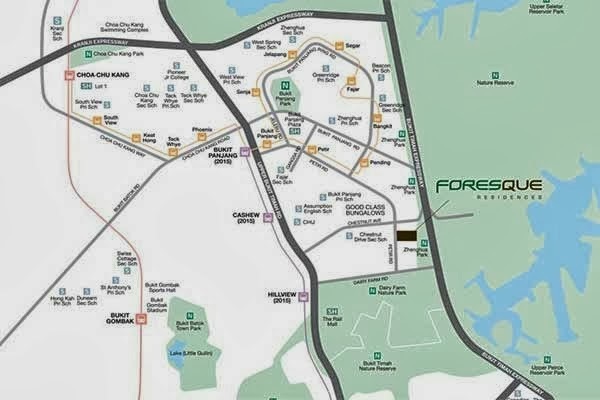 Foresque Residences is a highly developed property estate by the renowned Wincheer Investment in the intimate cental of Petir Road, Singapore District 23. It offers grand residential properties that will surely showcase your lavish lifestyle. This luxurious property offers state-of-the-art features and condominium facilities. All units are fully equipped with exquisite interior and exterior that showcase grandiose accommodation. You are conveniently accessible to famous destinations in the area such as the impressive Bukit Panjang Plaza, Junction 10, and Lot 1. Enjoy the luscious scenery of the fascinating Dairy Farm Nature Park and Bukit Gombak Park. You can also just leisurely shop at Shop N Save (Bangkit), Shop N save (Fajar) and the NTUC Fairprice or plan for a delicious dinner while choosing your best recipes at Cold Storage. The entire district is very accessible with MRT stations just nearby such as the Hillview MRT, Cashew MRT and the Bukit Panjang MRT. You can also choose to use the expressways and major roads for a hassle-free drive around the metropolis. To cater the entire family with utmost convenience, prominent schools and universities are just located nearby to provide you with premium learning advancement. Foresque Residences showflat is available for preview by appointment. View Brochure or Floor Plans for a feel of this development.